The fatal breach in South Africa’s defence against rhino poaching in the Kruger National Park is Mozambique – and corrupt diplomats are continually widening it –According to a study just released by Global Initiative Against Transnational Organised Crime, the country is incapable of disrupting the criminal syndicates that have turned it into a major trans-shipment point for rhino horn, heroin, cocaine, methamphetamine and dagga. The value of illegal drug trade in Mozambique, it claims, is probably greater than all foreign aid combined. Global Initiative rhino investigator, Julian Rademeyer, found that the corruption permeating every level of the Mozambique state and the country’s leaky ports, airports and borders, made it a smuggler’s paradise. Of great concern is what he describes as “dodgy diplomats”, particularly North Koreans, using this weakness to smuggle illicit products. Once hailed as a post-civil-war success story, Mozambique, he says, is a country in crisis, paralysed by rampant corruption, a weak judiciary, an ineffectual and criminally compromised police force, and powerful criminal syndicates with tentacles reaching into every level of the state. Many of Mozambique’s political elite, according to Global Initiative, have grown fat on the proceeds of the patronage networks that grew and festered for a decade under the country’s former president, Armando Guebuza. Added to Mozambique’s problems is its role as a key regional money-laundering hub, a dramatic increase in kidnappings-for-ransom and a series of high-profile assassinations that, among others, have claimed the lives of a judge, journalists and, most recently, a prosecutor. In May this year the country was also rocked by revelations that the government had tried to conceal close to $1.4 billion (€1.2 billion) in hidden loans from donor countries and agencies. The International Monetary Fund (IMF), the World Bank, the European Union (EU), African Development Bank, and several other donors suspended aid “pending a full disclosure and assessment of the facts”. An IMF official said the concealment “is probably one of the largest cases of the provision of inaccurate data by a government the IMF has seen in an African country in recent times”. Mozambique is heavily dependent on foreign aid. Conservationists in South Africa and Mozambique say they are encouraged by the work done by Mozambique’s National Agency for Conservation Areas, but are frustrated by the lack of progress from the Mozambican police in apprehending key poaching and trafficking ringleaders. The Global Initiative report highlights the increasing role and impunity of North Korean diplomats in criminal activities in the southern African region. An example was the arrest, in Maputo in May 2015, of a North Korean diplomat and a taekwon-do instructor after 4.5kg of rhino horn and $100 000 was found in their vehicle. Police detained them and impounded the vehicle. Within hours of learning of the incident, the North Korean ambassador to South Africa, Yong Man-ho, was on a flight from Johannesburg to Maputo. The diplomats were released after paying $30 000 and the vehicle was returned to them. Diplomatic and government sources in South Africa have made similar claims, telling Global Initiative that the North Korean embassy in Pretoria is “actively involved in smuggling ivory and rhino horn” and may be linked to other illegal activities. There are also allegations that the North Korean embassy in Addis Ababa is being used as a transit point for the smuggling of illicit wildlife products to China, with embassy officials abusing their diplomatic status to act as couriers. Since the mid-1970s, North Korea’s involvement in transnational organised crime – particularly drug and cigarette trafficking, weapons smuggling and the production of counterfeit US currency – has grown steadily, peaking during the severe economic crisis and famine the country faced in the early and mid-1990s. North Korean embassy officials have been implicated in 16 of the 29 smuggling cases involving diplomats that Global Initiative identified in a variety of sources dating from 1986. A 2007 assessment of illicit activity and smuggling networks concluded that “North Korea possesses sophisticated smuggling capabilities developed from years of transnational criminal activity, driven by economic necessity and justified with ideological veneer”. These illicit activities are said to be controlled by a shadowy agency known as Division 39. The US described it as “a secretive branch of the government… that provides critical support to [the] North Korean leadership, in part through engaging in illicit economic activities, managing slush funds and generating revenues for the leadership”. In this, North Korea’s embassies appear to play a key role. From the mid-1960 to the late 1990s, according to Global Initiative, Pyongyang poured military and financial resources into Africa, hoping to sway newly independent countries to recognise the North Korean leadership. Embassies were established across the continent but quickly became a financial burden. After the country defaulted on its international debts in 1975, its embassies were required to “self-fund” their operations, a practice that continues to this day. “Diplomats are expected to earn enough money to supplement their paltry salaries and be able to make sizeable financial contributions to the central government in Pyongyang.” Some embassies even use their vehicles as a private taxi service. According to Rademeyer, the need to self-fund is part of the reason Korean diplomats have been implicated in crimes ranging from diamond, gold, drug and gun smuggling to trafficking in counterfeit currency, cigarettes, medicines and electronics. With seeming immunity from prosecution by African states, supporting organised crime seems to have become one of the primary preoccupations of North Korea’s beleaguered embassies. With most of the planet’s rhinos in Kruger Park, which borders on Mozambique, the future of the species remains extremely tenuous unless South Africa and the world takes action to hold Maputo and North Korea to account. When police stormed a house in Matola on the outskirts of the Mozambican capital, Maputo, on May 12, 2015, little did they expect to make the largest seizure of ivory and rhino horn in the country’s history. 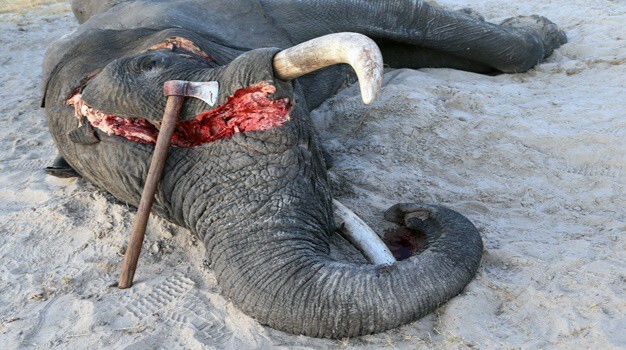 Packed into shipping crates and piled on the floor were 340 elephant tusks and 65 rhino horns. Together they weighed about 1.3 tonnes, representing the deaths of at least 170 elephants and more than 30 rhinos at the hands of poachers. Fresh blood spatter and the rank smell of decay indicated that some of the horns were from recent kills. One of the occupants of the house, a Chinese national, was taken into custody. A day later, a second Chinese man was arrested when he offered police investigators a $34 000 bribe to drop the case. Traffic, the wildlife trade monitoring network, praised the “highly significant seizure” and said it hoped the arrests would signal “a new chapter in Mozambique’s history of wildlife trade law enforcement”. Tom Milliken, Traffic’s rhino and elephant programme leader, said it was “now absolutely vital for a full and thorough investigation to be carried out”, adding that “the opportunity must not be squandered”. But it was squandered. A dozen horns vanished within days of the raid, despite being under guard at the police’s provincial command headquarters. They were replaced with crude replicas made from “bull horns”, according to some reports. The Chinese suspects were released on bail after promising to return to court in November. They disappeared without trace.